I was a bit reluctant to pick this one up. If you have been a long time reader of my blog you will know that when I first discovered the Southern Vampire Mysteries I absolutely loved them, and I marginally enjoyed True Blood. But as the television show went on the books began to cater to the show's audience rather than the books, and the author seemed to enjoy winding up her loyal readers. I stopped watching the show a few seasons ago and although I have continued to read the books I have set aside how disappointed I can get by them and try to just read them as an interesting story, not as a fan. Sookie's twelfth and penultimate mystery to solve involves a young fangbanger winding up dead only a couple of hours after Eric has taken a sip. Naturally he is the chief suspect, so Sookie has to start investigating, even if it is reluctantly. She doubts that the murder was entirely coincidental as her own arrival while Eric was having his dinner seemed to be planned to cause problems between the couple. Other suspicious circumstances cast doubt upon Eric's guilt and Sookie gets embroiled in yet another dangerous enquiry in the night hours while her Fae family cause her all manner of problems during the day time. 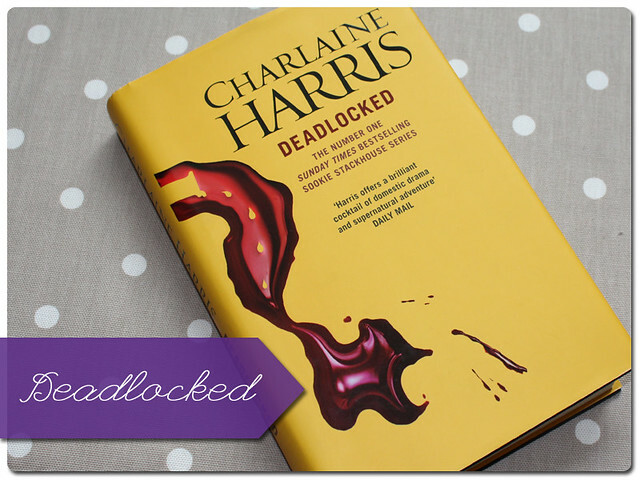 Deadlocked felt less chaotic than either Dead Reckoning or Dead in the Family, there seemed to be a more unified plot line, which may be because Harris is leading the series to its conclusion. I found it interesting how Harris had Sookie use the Cluviel Dor, and I know a lot of readers hated it and what it probably means for the conclusion (I have actually read book 13 now, so I know that it does) but I am actually looking forward to the repercussions of that decision. Harris is well known for creating an ending for her characters that is not the norm, and I don't think Sookie will be much different. Although this was an easier read than the last couple of books to come out of the series, it still felt that this was merely a means to an end. It has felt like Harris has been bored of this series for a while now, and as the longest series she has written so far I am not surprised. If you have invested a lot of time reading all the other books and want to complete the series I encourage you to do so, but if you have never read any of the Sookie Stackhouse stories I would recommend you stick to the first half of the series while they were still good.